There are actually two types of galleries; the main site Crawlers Gallery is where members can post club run pictures and there are personal galleries where each member can create their own gallery. Each gallery can hold any number of different albums. Alums provide a way to categorize your pictures. 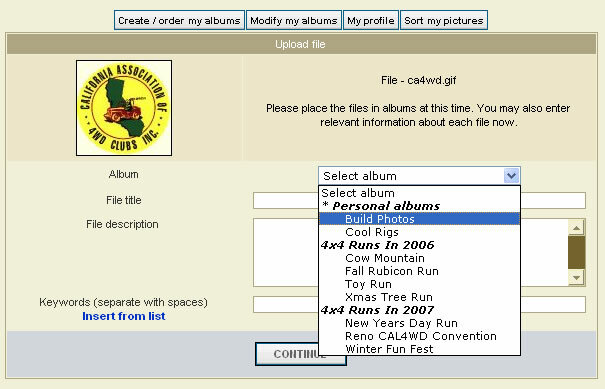 This HOW-TO will cover how to create a personal member album and how to post pictures to it. Members can also post to the Crawlers gallery using the same technique discussed here. From the home menu select the Users Gallery button. 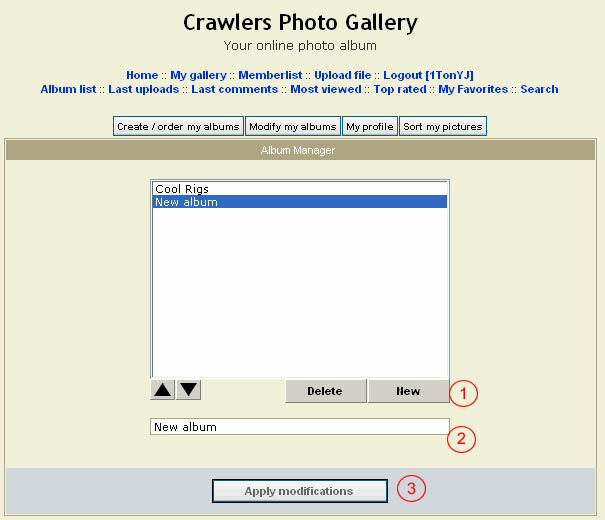 From the Crawlers Photo Gallery, the button to "Create / order my albums" (shown below). With your new album created, it's time to now add pictures. But, before going any further, let's talk about image sizing. The maximum image size we currently allow is 500 mega bites and a maximum width of 1024 pixels. If your images are larger than than this you must first resize (down-size) your image. Disk space is a premium and larger images take consideribly longer to up/download. See the FAQ on resizing images. Click on the "Upload file" link as shown below. 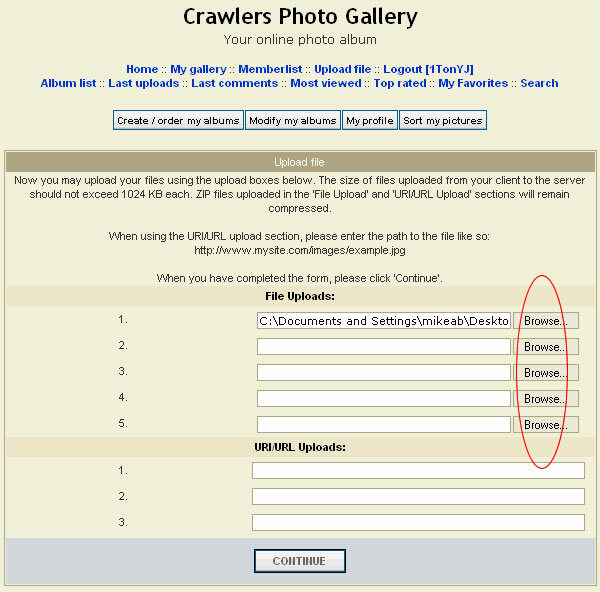 After clicking the "Upload file" link (as above) you will be presented with a form to select the files to upload (shown below). You will be able to select up to 5 files at a time. Click on one of the the five "Browse" buttions and select a local file. When finished selecting files, click on the "Continue" button. 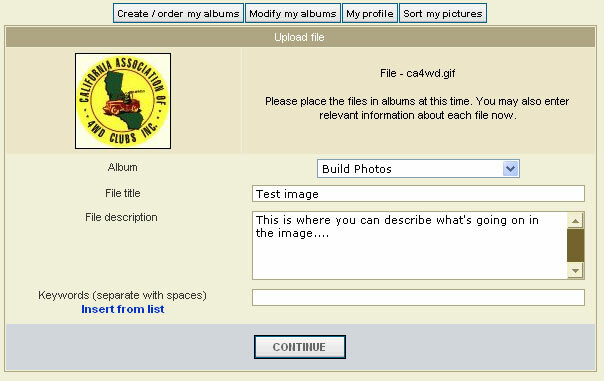 The next form (shown below) allows you place the selected pictures in a particular album and to add comments. Select the newly created personal album; in this example it is "Build Photos". Note: at this point you could have also picked any one of the Run albums to place your picture. Fill in the text areas for "File title" and "File descriptoin", and then select "Continue". Note: this page will be presented for every file you upload. So, if you uploaded five photos you will have to fill in this info five times. ...and that's all there is to it. Happy posting.